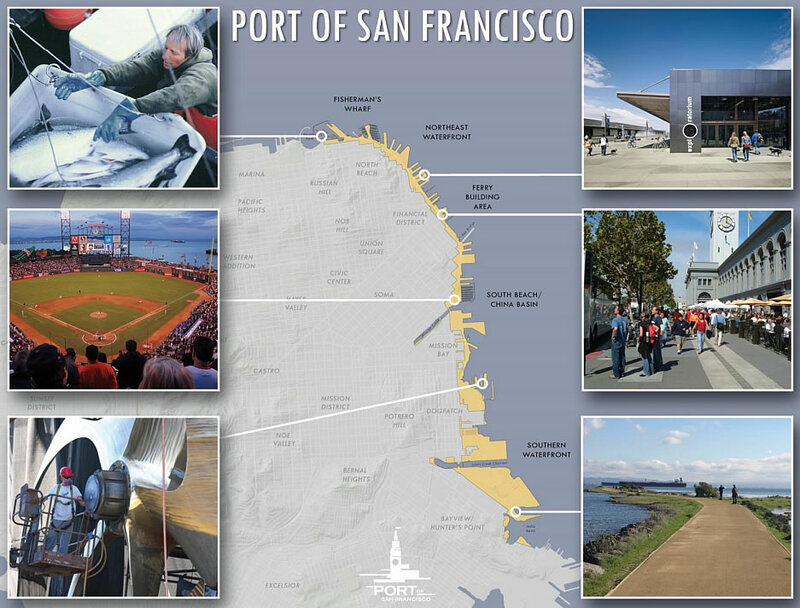 Over the next year, the Port of San Francisco will be overhauling the City’s Waterfront Plan for over seven miles of shoreline, stretching from Aquatic Park to India Basin. That includes 39 Piers (only 11 of which have been rehabilitated) and over 100 acres of waterfront open space, either existing (87 acres) or in the works (44 acres). Challenges include revisiting the allocation of land, buildings and piers for existing and future development versus preservation and public open space; addressing the waterfront’s aging infrastructure and rapidly growing transportation needs; and planning for a likely sea level rise of three feet within the next hundred years which could wreak havoc along the shoreline and on Mission Bay. And then there’s the challenge of how to fund it all with a projected need of $1.6 billion, primarily for deferred maintenance and renewal work, over the next ten years alone, not accounting for seismic upgrades, seawall improvements or any projects to start addressing the projected sea level rise. But the groundwork for a Waterfront Plan overhaul has been laid, working groups are forming, and the recommendations to shape the future of San Francisco’s waterfront are slated to be drafted by the end of 2016 and finalized in early 2017. No Transbay Terminal in 2100? If the city (or someone) bails out the TJPA, the terminal will be done by 2018 or so. But getting trains into that station will take more than several billion dollars; it needs a rethink. The terminal will be done in 2017. The Downtown Extension will take more than a billion, the last estimate was 900m, so probably higher than that in the end. It isn’t an unreasonably huge amount of money for a massive project like this. Connecting Los Angeles and San Francisco by high speed rail will bring about far more than a billion in economic growth. To say that the rail component of the terminal needs a rethink is not to give up on rail. The MTC has been reviewing and updating the costs of the current project. The prior cost estimates are from 2009. Also, did you mean to say if the City or someone else bails out on the TJPA the terminal will not be done by 2018? But yes, it needs to be rethought. IMO the connection between LA and the Bay Area will happen – in several decades – but HSR will go up the East Bay and not the Peninsula. Too much big-money opposition from hi-tech residents of the Peninsula who have influence at the State level, to see this thing getting built in their backyards. If the parcel F fiasco can’t be solved, another developer purchasing the site, how does that impact the terminal being done by 2018? I doubt HSR is ever happening. What if we build some kind of sea-wall, let’s call it a ‘Wall on the Waterfront’, to protect against sea level rise? Why so much discussion of the Transit Center under this topic? Um, maybe because other than the Embarcadero BART Station, the waterfront is lacking reliable mass transportation options? So when is the last time they did this? 2008; lots more information is available via their site, and a good place to start would be: Waterfront Land Use Plan. The review of the plan is supposed to happen every 5 years, but the comprehensive review process itself takes 2 years, so that timespan seems to be a bit too short. The working groups are formed and the overview & discussion meetings have already started – the next one (open to the public) is on January 13th at Pier 1 in the Bayside Conference room. The working group portion of this is all volunteer time. 3 feet of sea level rise is the absolute minimum projected over the next hundred years. They should be planning for 4 to 6 feet, and at least have contingency plans ready for a worst-case scenario that exceeds 6 feet. I don’t want to put words in his mouth, but I think Some Guy’s point is that they should be planning for something more than “likely”. How about removing all the piers and opening up the waterfront views? SF’s finger piers are one of the things that make the waterfront more than just a view- things are happening down there. An active waterfront with museums and businesses and restaurants is far more interesting, and there are plenty of views still to be had. I love the old pier buildings, they give the waterfront character and remind us of its working history. There’s plenty of unobstructed waterfront from Fort Mason all the way around the city west and then south, all the way to Fort Funston. 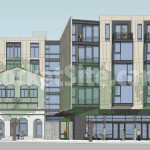 A major priority should be resolution of the Piers 30/32 saga and development of the seawall lot across the Embarcadero. Yeah, right. The entire pier will be demolished, no matter what. It’s just a matter of time. Only a handful of enterprises (e.g. cruise ship terminal or arena) generate enough cash to pay for the $300MM removal and replacement of the pier. 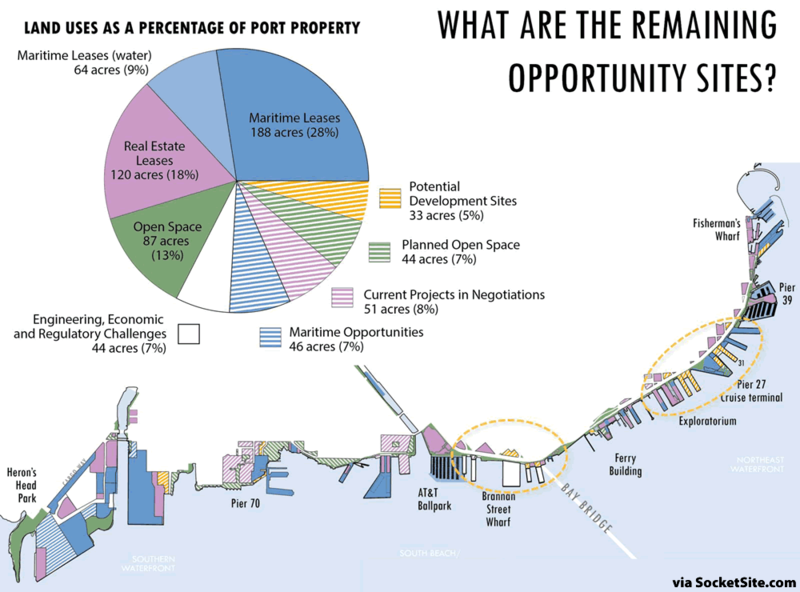 It’s not an attractive proposition, especially since the property would be leased to a business operator and still owned by the Port. I’d bet that that the pier gets demolished and not replaced. Rehabilitation for a light use such as a park/playing fields (as NYC/Brooklyn are doing with piers on the Hudson and East Rivers ) would cost far less and could be coupled to development rights to the seawall lot if permissible uses were loosened up. The demolition alone was estimated at $40 million and prioritizing funding even for that much will be challenging. The Port working group meetings scheduled for March, April, and May are likely to cover this in more detail. Time to rethink the plans for the plans, and get some reality dose injected into local development minds.